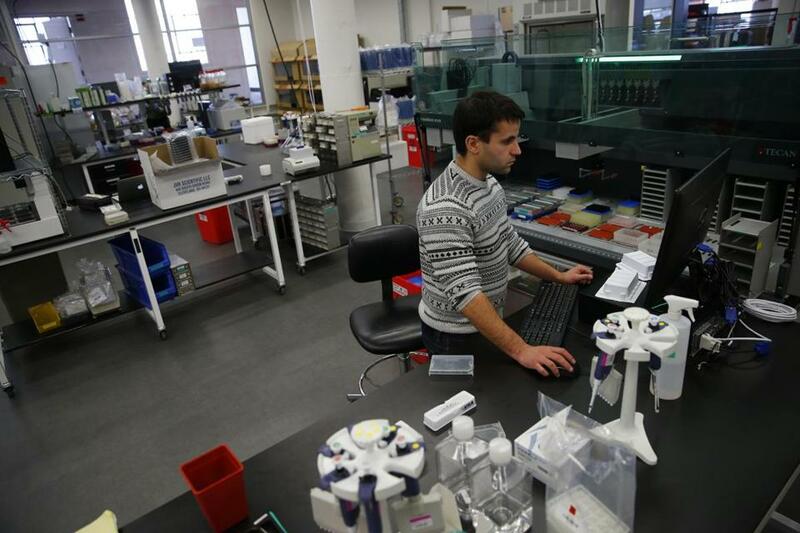 Build engineer Brian Carvalho, 24, of Cambridge, uses a liquid-handling robot to build DNA at Ginkgo Bioworks in South Boston. Jason Kelly was in Manhattan Thursday to meet with a prospective customer in the perfume business. Kelly, a founder of Boston-based Ginkgo Bioworks , sells custom-crafted organisms — mostly yeast, bacteria, and algae — and one of the jobs they can do is make synthetic scents that might one day go into a fragrance that you spray or dab on. Custom-crafted organisms? Yep, designed and produced in a lab that overlooks Boston Harbor. If textile mills represented the cutting edge of Massachusetts manufacturing in the early 1800s, this is one example of the extremely advanced manufacturing that could thrive in the 21st century. This month, Ginkgo announced that it had raised its first venture capital funding since it spun out from MIT in 2008 — $9 million — and it put the finishing touches on a production facility it calls Foundry1, full of automated machines that can cost hundreds of thousands of dollars each. Ginkgo is part of a field called “synthetic biology” that holds immense promise — but also freaks people out. It involves writing genetic code and inserting it into simple organisms to change their function. Boosters point to the possibility of vats of algae cranking out fuels or industrial chemicals that today come from petroleum, or to bespoke bacteria that could diagnose diseases sooner than we can today. But others worry about terrorists producing ultra-potent pathogens, or someone accidentally spawning a fast-replicating organism that damages the environment. “I think the good far outweighs the bad,” says Adam Goulburn, an investor at Lux Capital in New York who follows the emerging “synbio” industry. He compares it to 3-D printing, where it has been demonstrated that a 3-D printer can be used to create a working gun — but also inexpensive prosthetic hands. A field called “synthetic biology” holds immense promise — but also freaks people out. Knight says that while running a group in MIT’s Computer Science and Artificial Intelligence Lab, it occurred to him that “the interesting thing to program in the future isn’t going to be computers — it will be biology.” After all, the nucleotide-based code of DNA is not that different from the binary code that instructs computers. At Ginkgo, more than $15 million in early funding came from government agencies like DARPA, the Pentagon’s advanced research group — which had also bankrolled the ARPANET. Their belief, Kelly says, was the United States “should be on the leading edge of creating tools to program cells — sort of like creating the base elements of the early Internet.” One project focused on reducing resistance to antibiotics in the digestive system; another explored how to capture methane gas that is flared off during natural gas exploration and turn it into a usable fuel. Kelly asks a staffer to bring over some vials of fragrance that Ginkgo’s customized yeast have produced. Instead of extracting rose or citrus oils from flowers or plants, Ginkgo designs yeast that can make similar scents. I take a whiff of the future — but fail to correctly identify the three fragrances I’m offered. Kelly says that producing fragrances, flavors, and sweeteners in a more reliable way — without having to grow and harvest and process plants — will bring biotechnology to industries that haven’t been touched by it. While much of Ginkgo’s focus is on flavors and fragrances, the company is also designing probiotics — strains of bacteria that will do good things for humans. Some possibilities that Kelly mentions: probiotics that could fight the naturally occurring bacteria in your armpits or in your mouth, where they produce odor and tooth decay. 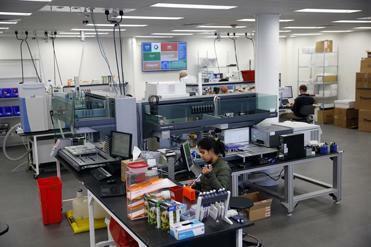 Local synbio companies like Ginkgo and Cambridge-based Gen9 , which supplies much of the DNA that Ginkgo uses, are still small. But the industry “is going to grow quickly, especially in Boston,” Harvard Medical School professor Pamela Silver says. A nonprofit in Cambridge called iGEM runs an international competition that teaches college and high school students about synbio, “training the workforce of the future,” vice president Meagan Lizarazo said. When I spoke to Knight a decade ago, he felt like synbio was still too young to be thought of as a “commercial enterprise.” But we might have arrived at that moment, similar to the spark-into-fire early days of the PC, the Internet, biotech, or the textile mill. The unanswered question of the next decade is whether the power players of this new industry will grow here.